Gemma & Nigel | Ellen Says Hola! This story is part of a series, Gondola Life. 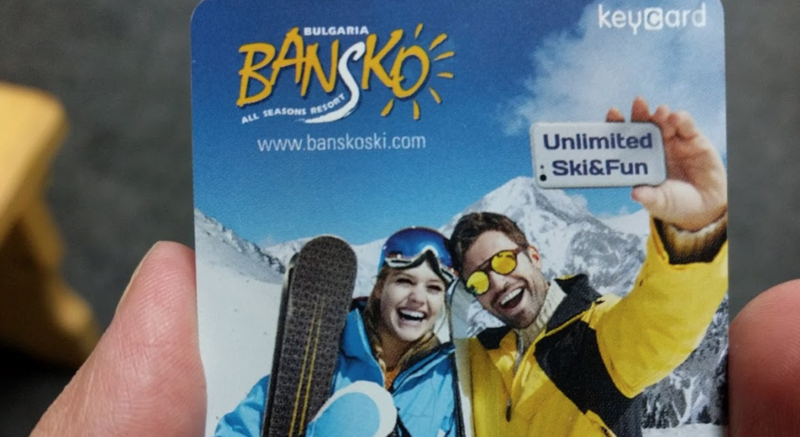 Every day to get up the mountain in Bansko, we share 30 minutes in a cramped gondola car with a few strangers. Then when the day is over, we do it again. This is usually a pretty silent affair — people are tired going up and exhausted coming down — but sometimes the atmosphere is just right, and we get a glimpse of other lives on the mountain. There is a phrase you probably know and use: “Bored to death.” To me it always seemed difficult to achieve: Surely you could just do something else? I now understand it’s actually a very active phrase. If you are bored to death it’s probably because you had to take brash action to remove yourself from a painfully boring situation. Such as jumping out of a gondola car mid-ride. Allow me to introduce Gemma and Nigel (I made those names up). When they clambered in, I had high hopes of a nice chat. They were about my age (ok, probably younger shut up) and they’d had the foresight to bring pizza along for the ride (three slices). I don’t need much more to spark a friendship. Thank god I held my tongue. Gemma was vapid and Nigel smitten, so I spent the ride listening to absolute nonsense delivered in quiet, posh, monotone British accents. And watching Gemma untangle a knot in one specific lock of hair. They didn’t acknowledge my presence even once, despite the fact that I unabashedly followed the conversation. Didn’t even try to look busy. Nigel needs more sunscreen than an albino on the equator. They — yes, they — applied so much to his face almost didn’t disappear into his skin. Gemma didn’t want any of the third piece of pizza but ultimately ate half of it. He knows her soooo well. Nigel is soooo happy to be here with Gemma’s family. Gemma and her cousins learned to ski in France, which is soooo much better. These slopes are good for beginners, like you, Nigel. Nigel is learning how to ski. Gemma is soooo much better. Gemma’s mom is somewhere in the lodge. Nigel can leave his backpack with her. That’ll be soooo much easier. How did such a small amount of information take 35 minutes to convey? How did they not once acknowledged another human presence? How did I keep myself from jumping?